This manual provides the basic knowledge and instruction to get you started and can be applied to beekeeping operations ranging from several thousand colonies to one or two. Queens of superior quality result from a combination of good drone rearing & stocking practices; good queen rearing practices; and a program of continual stock selection. Each of these three elements is addressed in depth throughout this manual. Contents include: Queen cell production; grafting; nutrition; pests & diseases; reproductive biology; honeybee subspecies; breeding stock evaluation & maintenance; genetics & the honeybee; selective breeding programs; drone mother colony management; nucleus colonies & mating apiaries; catching, caging & shipping queen bees; queen banking; queen bee introduction; queen markets; controlled mating; package bees. All our parcels are shipped by Australia Post. This includes tracking, and requires a signature upon delivery, for your added security. 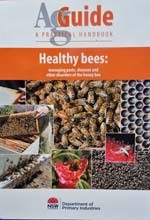 "Healthy bees: managing pests, diseases and other disorders of the honey bee"
- AgGuide, A Pratical Handbook. A basic guide to some of the skills and practices of bee production. Easy to follow for those new to bee keeping, this book contains step-by-step instructions, diagrams and full-colour pictures. Includes how to maintain hives, use a bee smoker, catach a swarm, remove and extract honey, health and pests in the hive, buying equipment, and working safely with bees. Published in 2007, Bee Agskills is 114 full-colour A4 pages.